Q: Can I have my body composition tested at Clem&Thyme? A: Yes! InBody testing is included in all appointments with our dietitians at Clem&Thyme. If you would like to come in for an InBody test only, we charge $50. 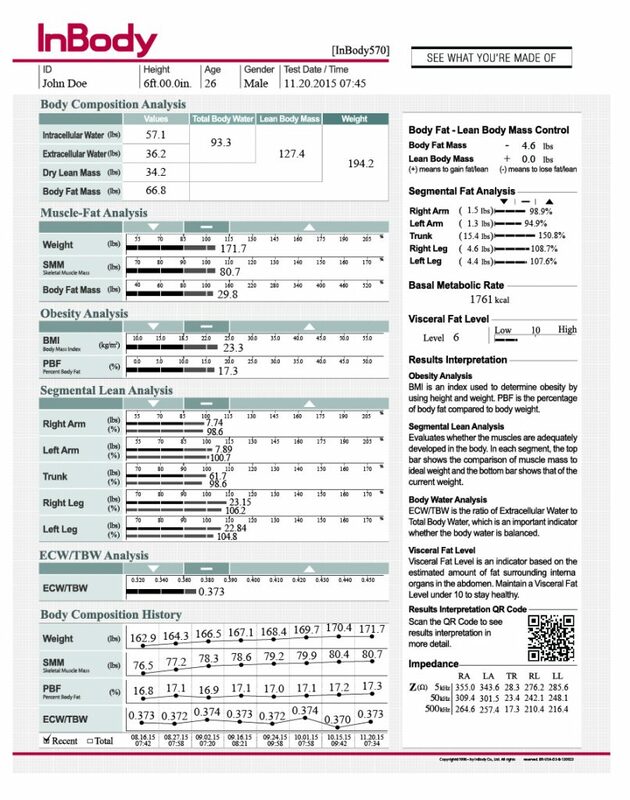 Contact us if you are interested in scheduling a time to have your body composition test done. Q: What are important guidelines users should or should not do before a test? Q: When is the best time to take an InBody test? A: Due to its high accuracy and precision, the InBody is able to capture fluctuations in body water distribution that occur resulting from diet and exercise. Similar to other body composition measures, when testing to achieve accurate body composition measurements, it is recommended to conduct tests earlier in the day/morning(following all precautionary steps) to mitigate the effects of violations of the precautionary steps. Q: What factors can affect the accuracy of my test results? A: Changes in body composition reflect body status, which may be affected by factors such as disease, nutrition, hydration, and medication. Accessories such as jewelry may interfere with the electrical conductivity. Improper posture will also affect test results. It is recommended to maintain the same testing conditions from test to test to produce high data reproducibility and comparability. Q: Are there any height, weight, or age restrictions for the InBody test? A: All of the InBody models have the same test ranges for weight, height, and age. Q: How long does it take to perform a test? A: The InBody Test lasts between 15 seconds and 120 seconds, depending on the model being used. Q: Who are not recommended to take an InBody test? Q: How do InBody devices work? A: InBody devices use direct segmental measurement bioelectrical impedance analysis (DSM-BIA), a patented technology, to precisely measure body composition by sending multiple electrical currents through the body, resulting in up to six different impedance readings for the trunk and each of the four limbs. Q: What are the advantages of using multiple frequencies instead of a single frequency? A: Using multiple frequencies improves accuracy and precision. At a single, low frequency, it is difficult for electrical currents to penetrate the cellular membrane and assess intracellular water. As frequencies get higher, the electrical current is more capable of penetrating the cellular membrane and accurately measuring intracellular water. A: Impedance is the frequency-dependent opposition of a conductor to the flow of an alternating electric current. Impedance is composed of two main properties, resistance and reactance. InBody provides segmental impedance values at varying frequencies to allow for accurate analysis of the human body. Since reactance is the interrupting force of alternating current flow, it increases in proportion to the integrity of cell membrane. Therefore, reactance and phase angle decrease when the number of cells is low or the cell membrane is more permeable or unhealthy. The more water there is, the lower the impedance. Q: How does the InBody derive body fat measurements from body water measurements? A: Body water volume is closely related to fat free body mass. When fat free mass is subtracted from total weight, body fat mass remains. Q: How to I interpret my InBody results sheet? A: Ask one of the dietitians at Clem&Thyme or check out this video!